Dr. Glen Riecken currently serves as Visiting Professor of Marketing at the College of Charleston School of Business. 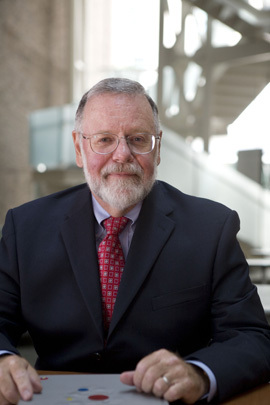 His previous academic posts were at Georgia Southern University (2000 – 2008), East Tennessee State University (1982 – 2000), Ball State University (1974 – 1982), Virginia Tech (1974 – 1976) and Concord College (1970 – 1973). During his tenure at both Georgia Southern and East Tennessee State, he served as Chair of the Department of Management and Marketing for a combined 22 years. Dr. Riecken also served as Interim Dean for 14 months at East Tennessee State. Throughout his career, Dr. Riecken has published over 50 journal articles in various outlets such as the Journal of Marketing Research and Journal of the Academy of Marketing Science. In addition, his works have included over 80 professional papers and presentations at venues such as American Marketing Association, Academy of Marketing Science and the Decision Science Institute. Glen has been active in several professional organizations in various capacities and currently is on the editorial review board for the Journal of Innovative Marketing. Dr. Riecken also enjoys student involvement. He has helped take student groups on study abroad trips to Mexico, France and Germany. He has also been faculty advisor to student marketing organizations and a social fraternity. A native of the Canadian province of Saskatchewan, Dr. Riecken now resides in the much more hospitable climate of the LowCountry with his wife, Jean, and his mother-in-law. González, M., & Quesada, G., Mueller, J., Riecken, G. (2013) A model to integrate new product/process development: An empirical study. 4th Annual Conference of the European Decision Science Institute. Budapest, Hungary, June 16-19. “What Will Happen To Tax Revenue? An Analysis of Georgia House Resolution 58: Revoke Ad Valorem Education Collections, and Replace Them With an Increased Sales Tax,” (co-authored), Proceedings: Association of Marketing Theory & Practice, Spring, 2006. “Comparing Donor Segments To The Easter Seals Society: An Empirical Study,” (co-authored), Proceedings: Atlantic Marketing Association, Fall, 2005. “Audience Characteristics and Humorous Advertising,” (co-authored), Proceedings: Association of Marketing Theory & Practice, Spring, 2005. ﻿For a more comprehensive listing of Dr. Riecken's presentations and publications, please see his CV. Riecken, W. Glen. “A model to integrate new product/process development: An empirical study” (co-authored) 4th Annual Conference of the European Decision Science Institute. Budapest, Hungary, June 16-19, 2013. Riecken, W. Glen. "An empirical model to improve the customer satisfaction in a manufacturing system,” (co-authored). 4th Annual Conference of the European Decision Science Institute. Budapest, Hungary, June 16-19, 2013. Riecken, W. Glen, & Kyle Hensel. “Using Humor in Advertising: When Does It Work?” Southern Business Review, Summer, 2012 (Vol. 37, No. 2), pp 27-37.